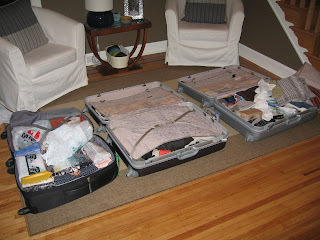 Here are our three suitcases opened up on the floor at home. Today was a bit depressing. 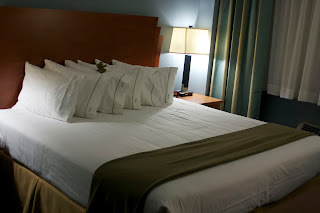 Worked all day, then unpacked from our trip at night. Today we took the Narita Express from Shinagawa to Narita, and then flew home. 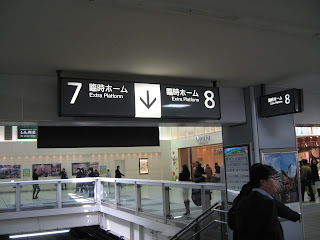 At Shinagawa there are "Extra Platforms" - for when new train lines are built? Our last full day here. We went to Andersen for brunch, walked around Yoyogi Park, then walked down Takeshita (shown above). It was uber crowded! Today we went to Zojoji in the morning and later we met my parents for the Cherry Blossom Festival at Yasukuni. It was awesome. Pretty sakura at night! What a busy day! 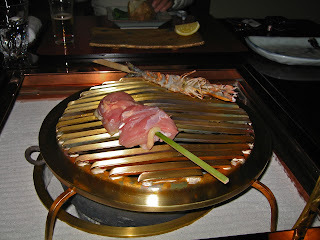 We went to Musashi-sakai, saw the old houses, went to Jindai-ji, and had dinner at Ukai-Toriyama. The prawn was alive a couple minutes earlier. 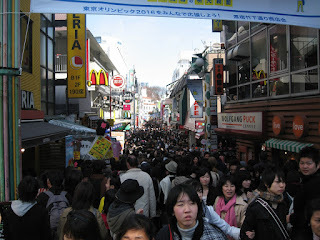 Today we went back to Kichijoji and Shinjuku - two of my favorite areas. 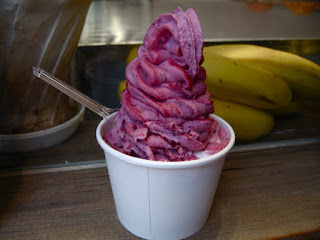 In Kichijoji we had Woodberry's Frozen Yogurt, which is so tasty. Today Chad and I wandered around Shibuya. It was a rainy and gray day so we spent most of the time at Loft and Tokyu Hands. Had crepes and Cafe Danmark. Yum. We went to Fabric Town (Nippori) today and bought way too much fabric. 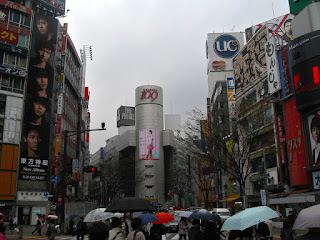 Then we went to Akihabara and explored Tokyo's "Electric Town." 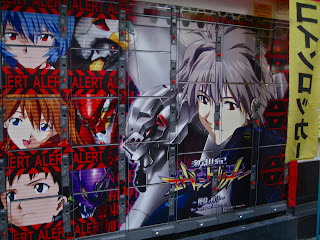 Photo from Akihabara. 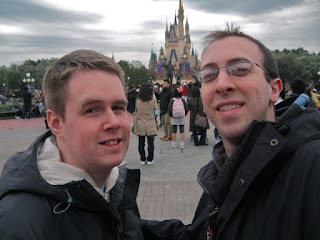 Today Chad and I went to Tokyo Disneyland (love it) and then met my parents to see Cirque du Soleil. Cirque was outstanding and Disney was a bit too crowded. But fun. Today we went to Macchinesti for brunch (yum!) and then to Sunshine City in Ikebukuro. Check out this ridiculous thing we saw at the Toyota Showroom (Amlux). 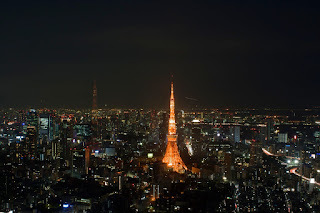 Here's a photo of Tokyo Tower from the observation level at Roppongi Hills. 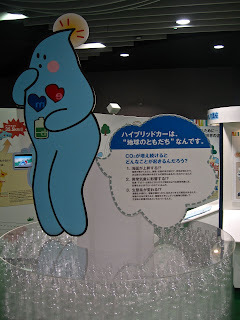 We visited Meiji Chocolate cafe today, What the Dickens, Mitsubaya yarn store, and others. Today we went with Andy to Shinjuku. 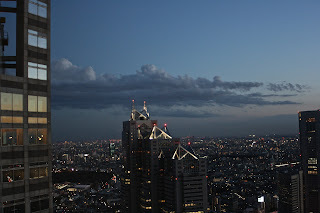 We saw Yodobashi, Fossils in Mitsukoshi, went to the observation deck at the government building, and ate at Aureole. Today we went to Kichijoji and went to the Ghibli Museum. 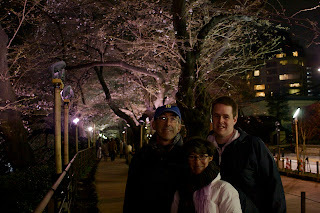 We met up with Andy in Inokashira park and then we met Javier for dinner. It was a great day! 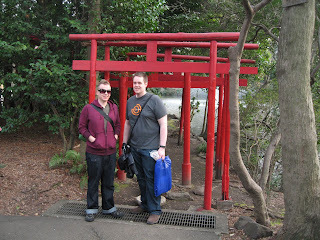 Today we went to Kamakura - a very traditional area near Tokyo. There we saw the Big Buddha and some other temples. 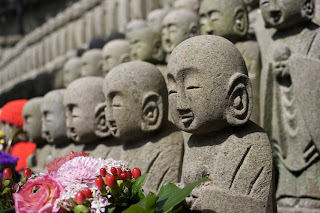 Here are some cool Jizo statues. 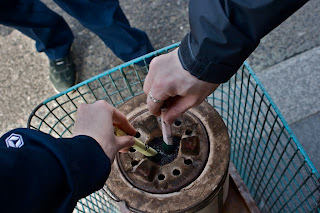 Here is a photo of Chad and my hands as we light some incense at Sensoji - the famous temple at Asakusa. The smoke from the incense is meant to heal/strengthen you. How do I choose just one photo? Tsukiji was the first thing we did today (then Meiji and Harajuku). 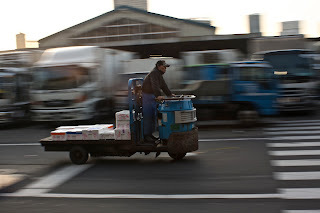 Here's an old guy driving around on a crazy cart vehicle. 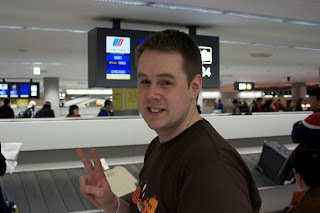 We arrived at Narita on-time and with no problems at all. This is Chad at the baggage claim waiting to pick up our suitcases. Next we head to the Narita Express. It is the start of our over 2 week trip to Tokyo. We are so pumped up, but not looking forward to the long flight to get there. 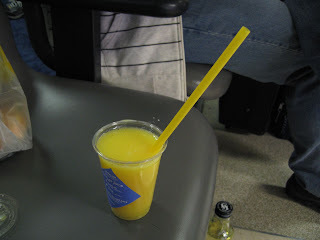 Look how long the straw is in this orange juice! We drove up to New York City tonight so we could fly out of La Guardia tomorrow. It was a bit scary because I drove through Manhattan, but we made it! Can't wait. 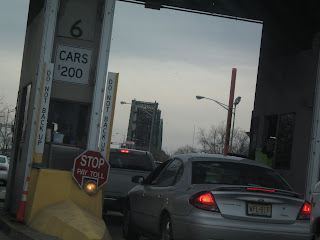 I got stuck at a bridge opening today. This might be the closest I've ever been to it when it happened. I was able to get a photo while it was up. So annoying. We met Chad's Aunts and Grandmother tonight for dinner at Friendly's. 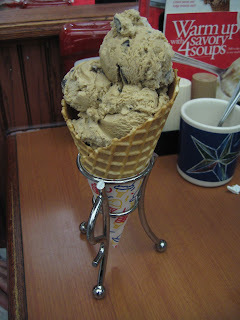 This was Aunt Beth's ice cream after dinner. It looks so good! I guess I forgot to take a photo today. This week is so crazy because we are preparing for Japan, yet I'm trying to finish up with my classes too. Craziness. 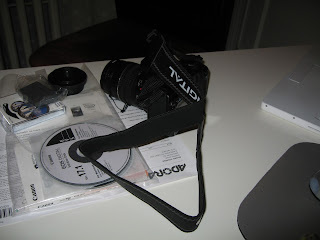 Chad was going to buy a bunch of film for his regular SLR before leaving for Japan, but I convinced him he would be happer if he got a digital SLR instead. So he did! 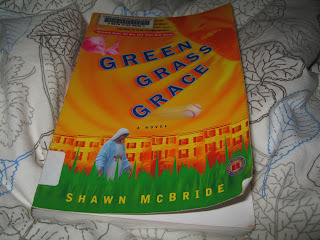 I'm reading this book for Book Club this month. So far I am really enjoying it. The style of writing is very fresh and unique, so it's fun to read. We had the windows open today because it was so nice out. 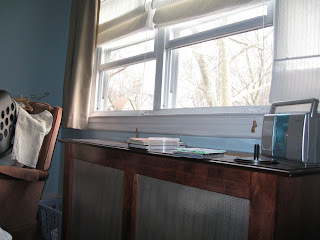 It's always nice in the spring when you can start opening the windows. Chad and I went to Old Navy tonight because Chad wanted a new sweatshirt. 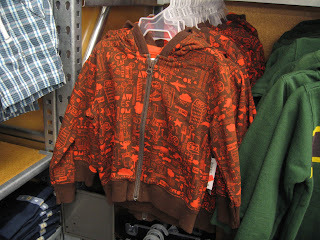 I saw this cute kids' sweatshirt. How adorable is this? I think my book club is punishing me for going to Japan. 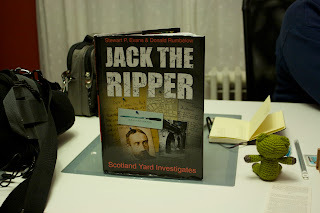 This is the next book that was selected. It's hard cover & about 5 pounds. I don't want to take this on the plane. 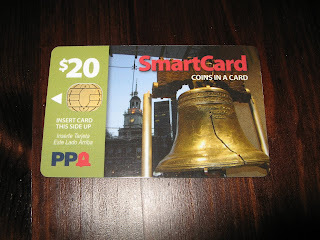 Today I didn't have any quarters when I got downtown for class, but fortunately they sell SmartCards at the student center and I had cash for it. So I bought one! Yippee. I need to get more sleep so I'm well rested for Japan. 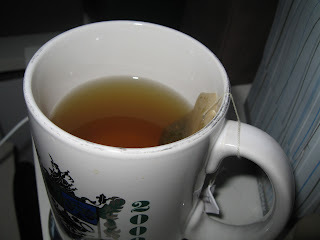 So I had some Yogi Bedtime tea tonight and boy did it help. Knocked me right out! That stuff is awesome. It snowed quite a bit today so I worked from home for most of the day. 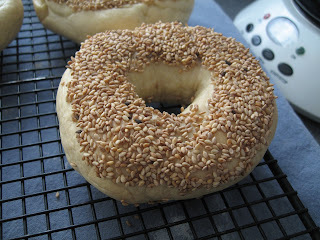 Since we didn't have much food, Chad and I made bagels. Yes, made. From scratch. Yummy. My mom bought us some Ikea placemats for Christmas in blue. 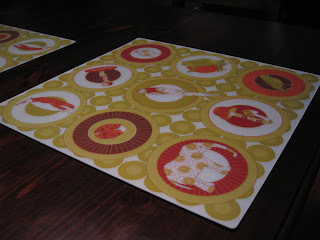 These are the same ones but in green. We couldn't resist buying more last time we went there.